I recently read a piece from NPR called “Shanghai Warms Up to a New Cuisine: Chinese Food, American Style” by Frank Langfitt. It really caught my attention. “What does Chinese food have to do with Druidism?” I hear you ask. It has everything to do with identity and authenticity – two things that modern people on the Druidic path are constantly thinking about, talking about, and confronting. 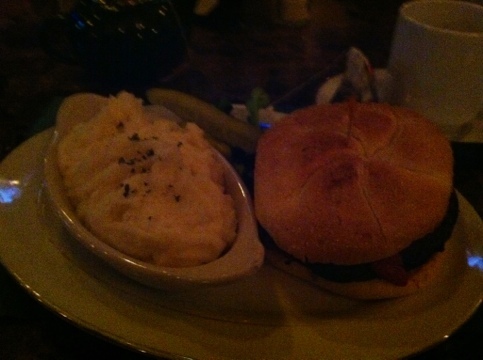 Some lovely mashed potatoes I had at Watertown’s own Irish pub, Coleman’s Corner. Fastforward to the present and recall every time you or someone you know critiqued an “ethnic” restaurant in America because it wasn’t “authentic.” Now, just to be clear – I completely understand the appeal of traditional food. America has a tendency to turn everything good into some weird, super sized, overly sweet/salty version of itself with high fructose corn syrup and artificial dye for good measure. But let’s be fair – that isn’t always the case. Many “ethnic” restaurants in America are local “ma and pa” places that have been passed down through generations that originate through, yes, immigrants! Immigrants who had to fight and often, for better or worse, give up parts of themselves to assimilate in America. My Irish ancestors were part of that process. March is coming. In many ways, March is like the American Chinese food of months for Irish diaspora like myself. Irish pride month is full of things we recognize as somehow Irish – traditional music, step dancing, Jameson whiskey, and soda bread. Yet it’s also full of things that make people who know a lot about their Irish heritage and its culture cringe – garish green “Mardi Gras” style accessories, green beer, poorly translated Gaelic t-shirts, and “Irish nachos” (whatever those are). Yet I try very hard not to let those things detract from my ability to enjoy celebrating my heritage. I know I’ve grown up in America and my nationality is American, but I am also of the Irish diaspora. You cannot take my heritage away from me. I’m not perfect and there’s so much more I want to learn about and engage in with regards to Ireland. I want to learn more Irish, practice more traditional music on my viola and bodhrán, read more history and mythology, fight to preserve the land in America and Ireland … And I do so with the greatest amount of respect and an open mind. I wasn’t always this way. I’ve grown up from a relatively ignorant child who thought Ireland was all about green beer and old castles with stones to kiss, to an equally ignorant new Pagan who felt St. Patrick’s Day was the worst thing ever, to the modern Druid I am who embraces Irish pride month and thirsts to know more about her heritage – ancient and modern. I will forever be on that journey, and I know others are on similar tracks. When it comes to Druidism, it’s far more productive to live my path and offer guidance when asked rather than turning my nose up at everyone who wears their plastic Mardi Gras St. Patrick’s Day beads or insists that “Bring Back the Snakes Day” is a good idea. If my country were an Irish American pub menu, yes there are a lot of Irish nachos and loaded Irish potatoes and whatever other very “American” breeds of Irish diaspora, but there are plenty of people like myself. And although I get annoyed with the so-called “plastic paddies,” we all start somewhere and even most people who value the traditional also enjoy the comforts of their childhood (like my fondness for Americanized soda bread from time to time). Although it’s not something I see often, occasionally a Pagan from Europe will look down his or her nose at the diaspora, as if we are somehow less than deserving to embrace our heritage – usually as a result of people who have lost touch with most of their ancestry, have yet to delve into a deeper exploration of their past, and instead fill that part of them with what modern America tells them is Irish. American, Canadian, Australian, English, South African, and all nationalities of Irish diaspora should not be deterred from embracing their heritage and honoring their ancestors who left Ireland for whatever reason. They did what they felt was right, and unfortunately that often meant giving up some of their traditional ways to fit in. The fact that we have any Americanized “ethnic” food is because immigrants from all over the world came here and engaged in the overwhelming give and take that happens in very diverse places. There was sacrifice. For better or worse, it happened and the food they produced, the culture they produced, is still authentic – just not necessarily traditional! We are authentic Irish Americans – which can mean a great many things, including embracing some of the traditional ways of the Old World… or making Irish nachos. So when you worry about whether or not the dishes in American Chinese restaurants and American Irish pubs are “authentic,” realize that they are! They are authentic Americanized versions of recipes that our immigrant ancestors brought over and experimented with over generations just to fit in. Whether or not you think assimilating was right of them or society, dwelling on it for very long is fruitless. Rather, honor the ancestors’ by toasting their efforts to do the best they could, reflect on how you can celebrate and encourage diversity today, and perhaps explore the traditional recipes your ancestors used to know. Perhaps, one day, more traditional dishes will rejoin the Americanized in the restaurants to provide a culinary history lesson. I honor and work with the Three Kindreds: the Nature Spirits, Gods and Goddesses, and the Ancestors. The later tends to fall to the sidelines all too often in my daily practice, which is very unfortunate. I pride myself and my tradition for paying better attention to the beloved dead, but I know I have room for improvement. And since most cultures who venerate ancestors share the belief that they are more likely to help you than the other spirits due to their vested interest in the tribe, it makes sense to keep that hospitality flowing! A fellow ADFer really inspired me by posting about having coffee with her ancestors. I’m not much for coffee, but I could surely share tea! The only problem was that my ancestor altar had become a tiny corner on my bookshelf which is relegated to a hard to reach corner in our new place. Boo! 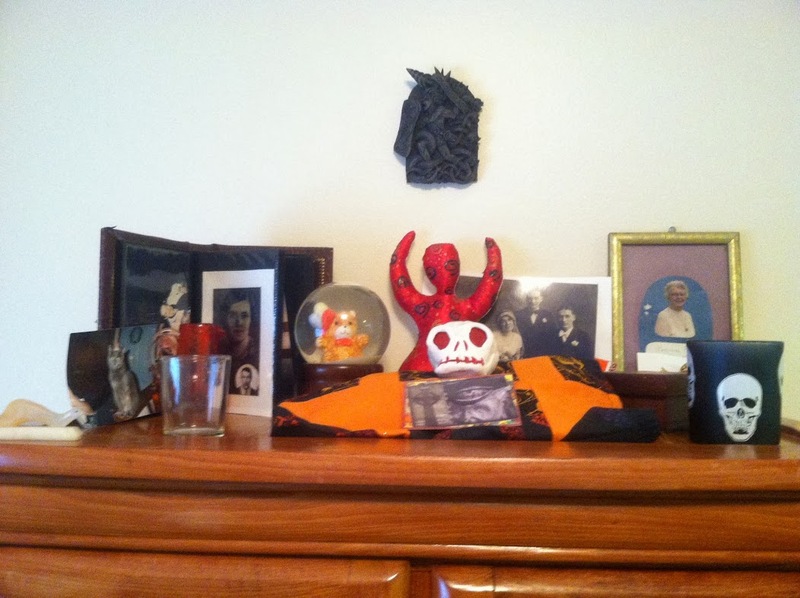 My ancestral altar, all moved in to the dining room. Photo by Grey Catsidhe, 2014. After I moved the altar to its new home, I felt called to make some Irish soda bread. 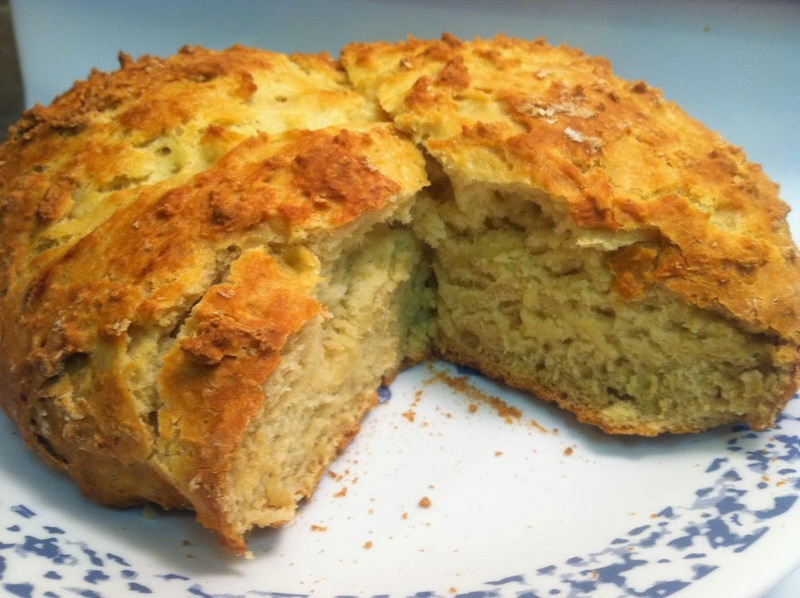 I never made traditional soda bread before, so I searched for a manageable recipe. I wasn’t sure if I would like it without raisins or caraway seeds, but it came out wonderfully! And of course, the first piece went to the ancestors. Today, as Bee and I enjoyed our breakfast, I shared some tea with my ancestors, invited the beloved dead, and delved into some Celtic studies. It occurred to me the ancestors were talking to me through the history book… How appropriate. My first attempt at baking traditional Irish soda bread! Photo by Grey Catsidhe, 2014. The Vernal Equinox approaches and, as is customary because of our modern schedules, Muin Mound is to celebrate on the weekend – March 17th, to be exact. For those of you who live under a rock, that’s St. Patrick’s Day. A column from the General Post Office in Dublin on O’Connel St. If you look close, you can see the bullet holes from the Easter Rising in 1916. Although the story is more complicated than religious differences, such tension plays a part as Catholic Ireland wanted independence from Protestant England. Photo by Grey Catsidhe. Last year, I posted about why I use this day to celebrate my Irish heritage. I also discussed why I no longer buy into the celebration of “All Snakes Day” or “Return of the Snakes.” To summarize, it all comes down to a desire not to focus on religious divisiveness and instead celebrate a commonality. A few days before Muin Mound’s Imbolc celebration, I woke up from a dream and felt very moved to lead the Spring Equinox Rite to honor Éire, Ireland herself. What better time than when so much energy is focused on her (albeit mixed with racial stereotypes and green beer)? My grove was favorable of the suggestion so I’ve been working on the ritual outline for the upcoming occasion (despite all my other obligations. My ancestors insisted quite a bit.). In addition to honoring Éire, we’ll also pay respect to Amergin, the ancient bard who made a pact with her which allowed our Irish ancestors to settle there. In my opinion, this began a tradition of reciprocity between us and the land. For allowing the Míl to live on Ireland (and defeat the Tuatha de Dannan in war), Amergin promised Éire (and her sisters Banba and Fódla) that Ireland would forever carry her name. The challenge for me was how to include the celebration of Spring into this mix. Many in the grove still wanted that emphasized which made sense to me. I decided to include language that praises the green of Ireland while also welcoming the return of our own green here in America. I also focused on a rebirth of our spirituality, inspired by Ireland, just as the spring marks new life. Thus, we will meditate on physical and spiritual rebirth. Another challenge was a grovemate’s request that I teach a tutorial on making felted Ostara eggs. True, this would take place early in the day and well before the rite. Yet the expectation is likely that many will use these as offerings. Indeed, I made one to be the main offering! Of course, there’s the very Anglo-Saxon energy of Ostara eggs which is not, at first thought, compatible with a rite to honor Ireland. What to do, what to do…? I remembered reading about the supposed Druid Egg, a magical stone/egg produced by snakes and used by Druids. The snake, in many cultures, represents rebirth and is as good a spring symbol as the chicken! And I find myself, in trying to avoid an “All Snakes Day” celebration, making felted, Ostara-inspired, snake eggs. There is cosmic humor in this. Still, our recent Irish ancestors, influenced by Germanic settlers, did dye eggs to mark Easter. So we will be honoring the ancient and more recent ancestors of Ireland. If you are looking for a way to tap into the energy of St. Patrick’s Day without the Catholicism or mixture with Spring Equinox customs, I highly suggest reading this post, “Liberalia, Hero-Feast of Cú Chulainn” by Aedicula Antinoi: A Small Shrine of Antinous. It’s inspired me to do a private devotional to Cú Chulainn this month. And I’m curious about my readers – how are you marking St. Patrick’s Day if at all? What about the Spring Equinox?